Framing vinyl records is great for the long-term display of your albums. Once you've taken the time to insert an album cover and hang the frame, it looks great and stands the test of time. And if you go the extra mile of adding a matte backing to your album cover, it can provide a very classy and professional aesthetic, like any great piece of art. BUT framing records takes time and effort. You have to disassemble the frame, insert the album cover, reassemble the frame, and hang back on the wall. Repeating this process when changing an album is far from simple. Record Props let you change vinyl records in seconds. They are specifically designed with this in mind – to easily display what is Now Playing – giving the listener a safe and easy way to continually change albums without disassembly. Framing vinyl records offers nearly unmatched protection compared to alternatives like record shelves or open-air displays. Frames can protect against the elements, particularly moisture, dust and degradation of cardboard covers over time... IF the frame is sealed on all four sides. BUT again this comes with the cost of considerable time and effort when framing, which means you probably won't be playing that record again anytime soon. In other words, this method is great for collectors. Another challenge we face: glass and plastic covers can easily show fingerprints, smudges and general fogging over time. If you don't plan to touch your frames, you're golden. But what if you want to go frameless? Custom shelves or album ledges are a nice alternative for changing and displaying what is Now Playing. Unfortunately, a gust of wind from the door shutting, or an open window, or even a curious cat can send your album covers down to the floor when you least expect it. 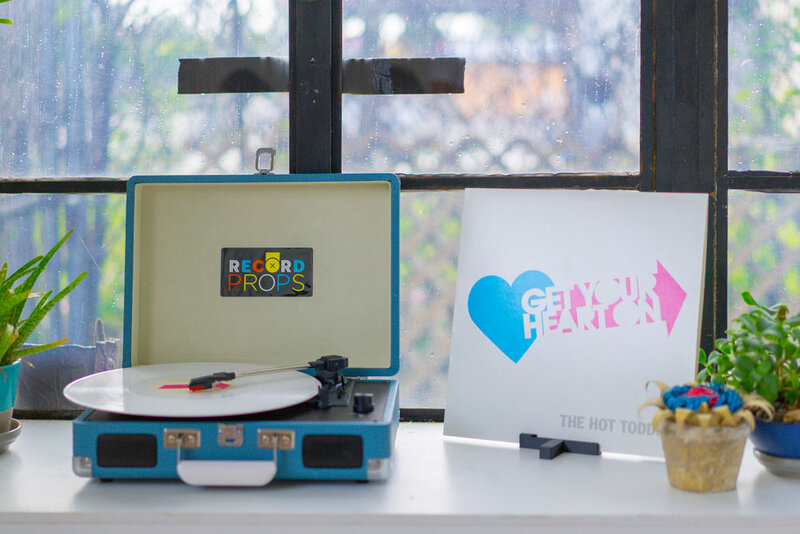 Record Props offer a frameless design that holds your album covers flush against the wall AND a protective bumper that holds your vinyl record safely in place too. The result is the effect that your records are floating on the wall. And you'd be hard-pressed to find any wind or cats knocking your albums down. Unless you're in a tornado. In which case... Run for cover. Framing vinyl records is, once again, best for long-term display. Changing out albums takes time, and framing limits the listener to displaying only the album cover or the vinyl record individually, but not both. Custom shelves or album ledges offer more flexibility, perfect for showing multiple albums at a time, while still giving listeners the ability to change them out quickly and easily. Record Props, like shelves, give listeners the option to change albums out quickly and easily, but they are also designed with the ability to pair both the vinyl record and the album cover together in one unique display. AND this can be done with single albums and most gatefolds (double LP's) in a number of creative ways. Album frames and record shelves often take several screws to hang on the wall. This can be a challenging investment, especially for anyone living in apartment settings. Each Record Prop takes just one screw to hang. Not only does it make it super easy get set up, but the included lock washer ensures your Record Props remain in place for the long term. AND the single screw design makes it easy to level and adjust if ever necessary in the future. Record Props (to our knowledge) is the only multi-use design that offers the option of displaying your albums on the wall or a flat, tabletop surface using the same display without disassembly. All it takes is a simple twist and listeners can go from wall to tabletop (or vice-versa) in literally seconds. And did we mention it was easy? We even tested it on a five-year-old just to be sure. She nailed it. Measuring just 4 inches in diameter (the size of a record label), Record Props were designed to be small and portable. DJ's can take Record Props with them to display what's Now Playing. Musicians can use them on tour at their merch tables. Listeners can show off their favorite artists. Cats can try to knock them down. You get the gist. Did we miss anything? Let us know. We think Record Props are the most innovative and versatile option for displaying vinyl records. But we also think you should be the judge. If you don't like Record Props, send them back for a full refund. We’ve got you covered.